ProtonVPN is the brainchild of the scientists, engineers, and developers from CERN and MIT who built the hugely successful ProtonMail – the largest secure email service in the world. 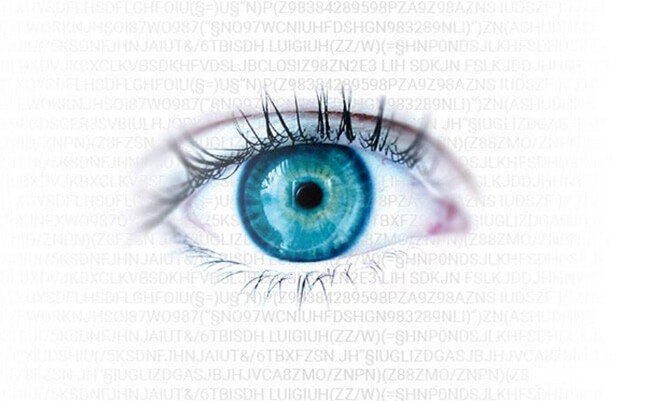 The Swiss-based service was launched in mid-2017 and it has been generating quite a lot of attention, especially among those familiar with the ProtonMail project. 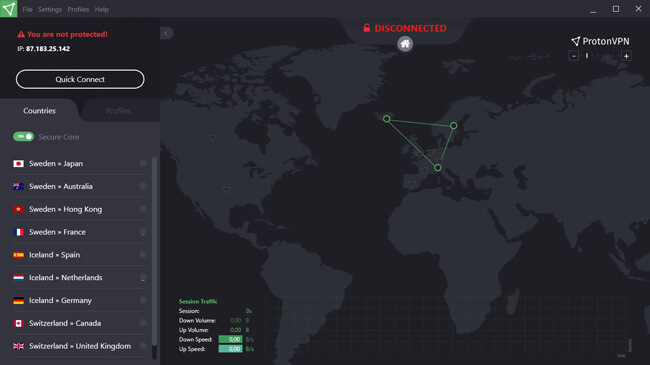 For the purpose of this ProtonVPN review, we have conducted an in-depth analysis of this service, aiming to reveal everything that is right and wrong about this relatively new VPN. ProtonVPN opted for a slightly gloomy color scheme with a white and light gray font and buttons on a dark gray background. The font could be larger and the whole gray-on-gray idea may not be the best solution, considering that not everyone has perfect vision. However, we like the uncluttered environment that allows for easy navigation and contributes to the intuitiveness of the software. Whether you prefer a country list or map view of the servers, you can easily identify and choose the desired virtual location and access all the basic features in one or two clicks or taps. Downloading and installing the software takes virtually no time and it is as simple as it gets. As long as you have the most basic understanding of what a VPN is and how it works, you should have no problem getting used to this extremely user-friendly VPN service. ProtonVPN operates more than 395+ servers in 30+ world countries, mostly located in Asia, Europe, North America, and Australia, with no unusual choices or particularly exotic locations. In addition to the fairly modest selection of standard servers, ProtonVPN allows you to enjoy an extra layer of protection with Secure Core servers – servers located in privacy-friendly countries, including Switzerland, Island, and Sweden. If you opt for Secure Core, your traffic first passes through ProtonVPN’s proprietary Secure Core servers and is then routed to the server in the location of your choice (Canada, the US, the UK, Germany, Spain, the Netherlands, France, Singapore or Japan). 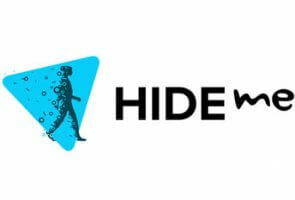 The employment of this method ensures that your location information and real IP address will not be leaked even if the endpoint server is compromised. Generally speaking, ProtonVPN allows you to enjoy excellent speeds, particularly if you opt for one of the more expensive subscription plans. Most of the time, the diminishment in speed is barely noticeable and you can stream HD content with hardly any buffering. The performance is as good as expected and there are no IP or DNS leaks. So far, so good. As far as compatibility goes, ProtonVPN does rather well, with desktop clients for Windows, MacOS, and Linux and mobile clients for Android and iOS. You can easily set it up on DD-WRT routers using the simple tutorial available on the website. For more good news, ProtonVPN is integrated with the Tor network. There are no bandwidth limits, but the speed is limited with the free version of the software. The number of simultaneous connections you get to enjoy depends on your subscription plan and ranges between 1 and 10 concurrent connections. 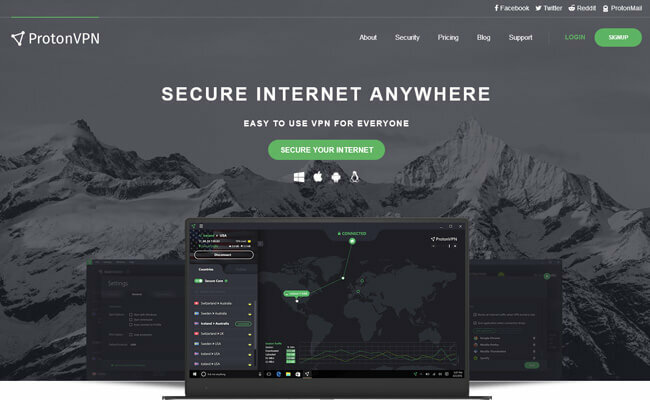 One of the most prominent features of this VPN service is the one we have already mentioned in this ProtonVPN review – its Secure Core network that provides advanced protection against network-based attacks and makes your real IP virtually untraceable, with your traffic routed through multiple servers within the network. Furthermore, ProtonVPN exclusively employs ciphers that have Perfect Forward Secrecy, making it impossible for malevolent third parties to decrypt your traffic. Striving to provide the highest possible level of security, ProtonVPN only supports IKEv2 and OpenVPN the latter being, the most secure encryption protocol in existence. It uses the strongest AES-256 encryption, with key exchange executed with 2048-bit RSA and HMAC with SHA256 employed for message authentication. The previously mentioned Perfect Forward Secrecy eliminates the possibility of traffic decryption. ProtonVPN is not required by law to store connection logs and the authorities cannot demand that a particular user’s activity is monitored. Thus, there are absolutely no logs kept, so there are none that can be turned over to third parties, including the government. Your private data remains private at all times. With ProtonVPN, you can choose between 4 plans: Free, Basic, Plus, and Visionary. With the free plan, there are no annoying ads and no bandwidth limitations, but the speeds are low. You can use the service only on 1 device at a time and you gain access to servers in only 3 select countries. No additional features are available, like Secure Core and P2P and Tor support. 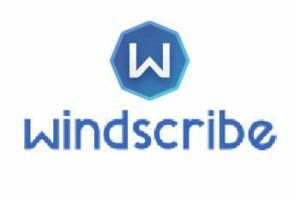 The Basic plan allows you to access servers in all countries, use the service on 2 devices simultaneously, and enjoy high speeds. However, you cannot use any of the advanced features. The price is $4 per month with the monthly subscription. 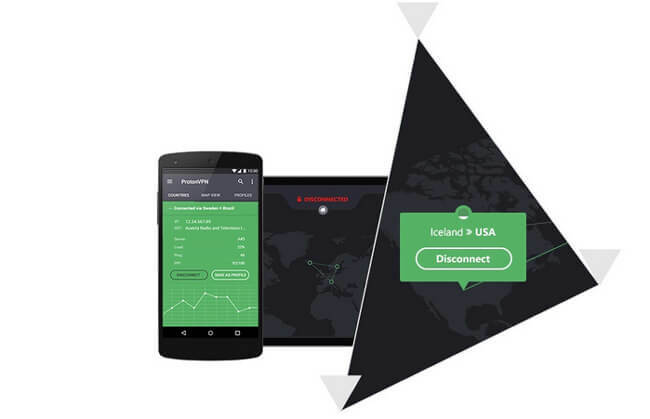 With the Plus plan, you can use servers in all the countries within the ProtonVPN network, enjoy 5 simultaneous connections, as well as the highest speeds, and connect to the exclusive, high-speed Plus servers. Furthermore, you get to route your traffic through both the Tor network and the Secure Core network. The price is $8 per month with the monthly subscription. Finally, with the Visionary plan, you get all the benefits included in the Plus plan, along with 10 simultaneous connections. The best part is that ProtonMail Visionary is included in the plan, so you get to use it free of charge. 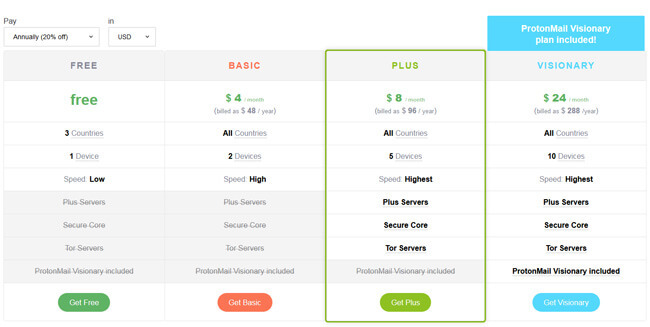 The price of the ProtonVPN Visionary plan is $24 per month with the monthly subscription. No matter which paid subscription you choose, you can cancel at any time and you are covered by the 30-day money-back guarantee. The annual subscriptions come with a 20% discount. Payment options include major credit cards, Bitcoin and PayPal. At the end of this ProtonVPN review, here’s a quick overview of the features that wowed us and the aspects of the service that could use some improvement. Our ratings are the result of an objective and independent evaluation of ProtonVPN, generating the final rating that reflects the overall quality of the company. Ratings may change as the service changes. ProtonVPN user rating based on 6 user reviews. Really easy to use, no logs, great protection, but I think that there should be a Visionary plan without ProtonMail and that it should cost less, because really, $24 is way too much. Awesome VPN, but needs more servers. Plus, don’t bother with the free plan, the speeds are unbearably low. 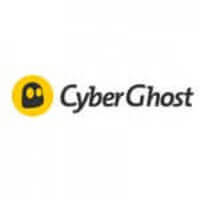 We found 1 verified ProtonVPN discount for April, 2019. Save 50% when you sign up for 1 year! Sign up and we’ll let you know about future ProtonVPN promo codes. If you like ProtonVPN but want to explore other options, take a look at our handpicked ProtonVPN alternatives below and find a similar VPN that satisfies all your needs. Discover the full range of possibilities ProtonVPN offers and become an advanced user in no time with our beginner-friendly ProtonVPN guides. Whether you are interested in secure torrenting, unblocking Netflix, setting up ProtonVPN on all your devices or you simply want to learn more about ProtonVPN, you can find verified information and clear instructions in our ProtonVPN guides below. Does ProtonVPN Work With Netflix? - which allows you to quickly find out whether you can successfully stream US Netflix using ProtonVPN.